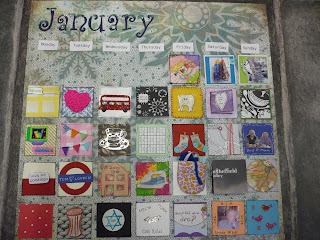 Apple Tree Crafts: January has ended!! Here's my page for January... the last Monday still needs some things sticking on it - but I can't seem to find where I put them. But it was something to do with the restaurant in Polish class..... there are some little food stickers hiding somewhere in my house - maybe the visiting cat (Puss Puss) has hidden them!